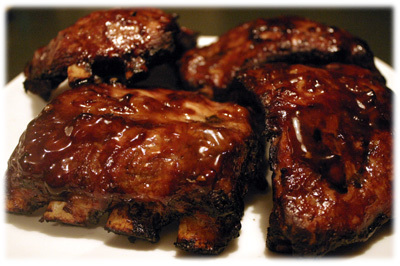 These Teriyaki Ribs are really a nice change of pace from the traditional BBQ flavored ribs. 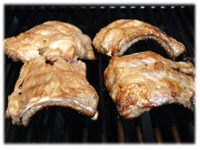 The pork ribs are first infused with a robust Asian flavor using our popular teriyaki marinade recipe, repeated below. 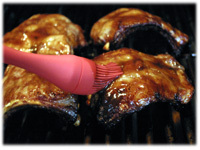 As they cook you'll baste them with this rich, sticky Teriyaki sauce recipe, also repeated below. These ribs taste even better when served with the fun Asian Hotpockets grilling vegetables and a side dish of rice. 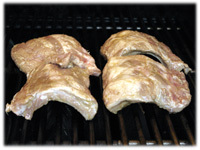 Just like the picture above these ribs come off the grill with a beautiful shiny glazed, stick to your fingers finish. Make sure the thin membrane has been removed from the back of the pork ribs, if not then you should remove it. 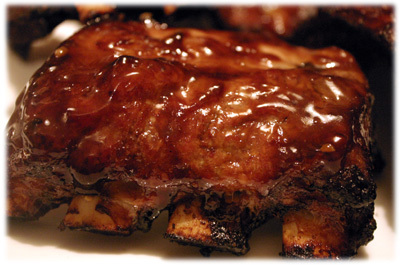 Refer to this bbq ribs recipe in Step 1 to see how. Mix all the marinade ingredients in a glass bowl. 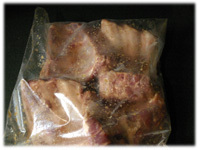 Cut each of the pork rib racks in half and place them in a resealable plastic bag. Pour in the marinade ingredients, seal the bag and refrigerate at least 4 hours but best if left overnight for maximum flavor. In a medium saucepan, combine the first 7 ingredients of the Teriyaki basting sauce recipe and bring to a gentle boil. Reduce the heat and let simmer on medium-low for 5 minutes. If you wish the sauce a little thicker mix 1 tablespoon of cornstarch with 1/4 cup hot water and stir into mixture until it thickens. Clean and oil the barbeque grates and preheat to 325F. When it reaches this cooking temperature place the teriyaki ribs bone side down (meaty side up) on the grates and close the lid. Check on the barbeque ribs every 20 minutes or so and move them around if some pieces are cooking faster than others. When there's 20 minutes left to cook the ribs begin basting them every 5 minutes with the Teriyaki sauce. This is what gives them the nice thick sticky glaze. Keep the grill lid closed between bastings. You'll know when the ribs are nearly cooked when the meat begins to retract back from the bones and you can see at least 1/4" of bone showing. Keep basting and when the ribs are cooked remove them to a serving platter, give them one last basting with the Teriyaki sauce and cover for 5 - 10 minutes before serving.